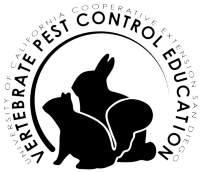 The mission of Vertebrate Pest Control Education is to provide flexible multimedia outreach and education focused on agricultural vertebrate pest control including pesticide application and humane trapping practices of wildlife in the state of California. The training programs offered here can either be for your own personal knowledge, or can be used to acquire Department of Pesticide Regulation (DPR) or Structural Pest Control Board (SPCB) credits for using specific control methods. If you are interested in obtaining DRP or SPCB credits, there will be a small fee for processing the Final Exam as well as providing you with a Certificate of Completion. Otherwise, you can complete the training programs without taking the final exam. This web link includes study materials to assist you in preparing for the PAC - private applicator certificate exam. A website for the control of California Ground Squirrels. Here you will find useful information for dealing with California ground squirrels. Here you will find useful information on Coyotes in California and how to deal with them. Here you will find information on vertebrate control from Bats to Wild Pigs. This is wonderfull for all the people who are workinng in agricultural extension. I live in Mexico am interested in your information. Studying (prep) to take the Interim Private Applicator exam.